The snow has been falling steadily outside in Chicago, bringing the pleasures of snow shoveling: a little Sisyphean circulation in an overfed and over-rested body. That body has too gladly fell into near hibernation on our holiday return from Kenya. I can’t help thinking of Kenyans here, this unimaginable climate, people who even turn down iced drinks on hot days in fear of catching cold. Their relationship with holiday foods is a lot more healthy and real than what’s happened here, unless you’re a vegetarian like me (again nearly inconceivable back in Kenya). For me, the icey temperature and the holidays have forced us to do absolutely nothing, after two of the most intense, rewarding, difficult, successful, frustrating months ever. I’ve been so tired I’ve totally missed the pleasure of reverse culture shock; it’s been just like a dream. There’s hardly been time for reflection and writing. Erica somehow managed to record her experiences and thoughts, the dedication of a professional. I hope I can recapture this incredible time in retrospect. Time to rejuvenate in 2010. We feel the strong pull to get back there, and we’re landing in Nairobi towards the end of the month. Two weeks ago we left Nairobi. And we had to squeeze in one more conference before leaving, TedXKibera #2, very much the best meeting of the entire trip. Every presentation and conversation was lit with such excitement and optimism … of doing some genuinely innovative and impactful and astonishing. Our friends from the Kibera Film School presented, their positive attitude, technical mastery, and connection to the wider world, an inspiration in the toughest moments of mapping in November. Organic farms are harvesting right in Kibera, built on the site of old dumping grounds, building local food security … the kind of land reuse and consumption issues challenging the status quo everywhere. PeePoople are introducing innovation to water and sanitation, a flying toilet that actually breaks down waste to safe fertilizer, and considering work on green roofs to harvest rain water and reduce heat in metal roofed homes … in addition to other group’s incredible work in sanitation, like the biolatrines. The excellent venue for TedXKibera, Mchanganyiko Women Self-Help Group, was itself built on a former dumping site, and entirely driven by women empowering themselves. All these things need mapping … the organic farms are already on the map, and the map can be used to locate more. The stories of Togetherness Supreme, the locations where it was shot, those can be mapped for promotion and for advising on locations with Hot Sun clients. Sanitation facilities, of course are mapped … some mappers even complaining that toilets are littering the map (a good thing!). The Map Kibera group, they fully represented at TedX, and have been meeting in our absence to plan how to institutionalize the work we’ve started. Working in Kibera is important to innovation everywhere. Working in Africa is important to innovation. Necessities are driving incredible creativity, a creativity the rest of the world needs to pay attention to for tomorrow’s challenges in urban and rural living … sanitation, food, water, and how to peacefully live together. Even the design challenges tomorrow’s technologies, augmented reality, have everything to learn from how space is negotiated in off the grid, on the edge places. Kibera is innovation. That’s why I’m very excited about the TedXKibera Fellowship program, announced last month … there are so many enthusiastic people, that only need advice and connections and pathways. 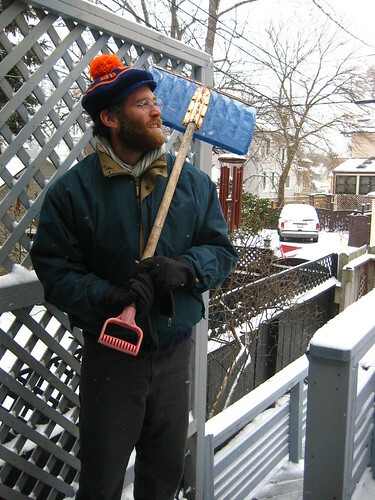 Before I get back, I’ll practice clearing paths on the snowy Chicago sidewalks. After reading Erik’s post on Google driving directions in Kenya, my thoughts wandered to how services built on OpenStreetMap data compared in Nairobi and Kenya. The main difference I can see is that with OSM services, when something is deployed anywhere, it’s usually immediately available globally, so we aren’t left waiting for opaque corporate processes to gift us with new features. I’ve compared MapMaker and OSM coverage before, and found them to be nearly equivalent in areas with high resolution satellite imagery. Yahoo has less satellite coverage generally, over a smaller area of Nairobi, so that is where you see the highest concentration of OSM data. Outside Nairobi, OSM relies mostly on the FAO Africover import, with select places surveyed in more detail .. I think mainly vacation spots :). This is quickly being supplemented as Map Kibera folks are borrowing GPS for their travels up countries in the festive season. Both Google and Yahoo imagery are over four years out of date. Anyone familiar with Nairobi’s rapid recent building spree can see it clearly from comparison with satellite imagery with known timestamps. This means that provider’s satellite imagery alone is not sufficient to map here .. you need both up to date imagery, and in situ surveying. That’s where GPS and Walking Papers show their strength in data collection. OSM has a very active developer community focused on routing. The products aren’t quite a slick as Google’s offerings, but just as powerful, mostly based on pgRouting. CloudMade’s routing is based on adding pins to the map, rather than search, but otherwise do a comparable job to Google’s routing choices. Like Google, CloudMade routing lacks traffic data in Nairobi. I do know that there are folks in Nairobi working on deploying traffic sensor systems. And folks working on matatu routes. Now t>he key thing is how we will see their data in maps. They could negotiate with Google to have their data included, and I can only wish them luck and a prayer for something like a good deal. But there is no need to wait for Google bureaucracy to start helping improve Nairobi traffic. They could simply build their own routing application with open source data and tools, that integrates their traffic sensor network. Erik seems to be having fun playing with his iPhone in Nairobi 🙂 (I stick to my solar powered, mPesa enabled phone here). Not many folks have iPhones in Kenya yet .. though you can find Chinese knockoffs on streetside mobile kiosks downtown. There’s no iPhone OSM routing yet. Still, there are a couple apps which offer really key features for Nairobi, and I hope Erik finds a chance to give these apps thorough testing here too. OffMaps is local caching of maps on your iPhone, which means you can store all of Nairobi locally with no need to spend buckets of airtime repeatedly downloading maps. MapZen POI Editor is collection of OpenStreetMap points of interest on your iPhone. It’s probably the most user friendly way to contribute to OSM. Now I don’t think it’s entirely fair to Google that Erik critiques the misplacement of his father’s office on Upper Hill. The whole idea with collaborative cartography is that the map can be improved by anyone. However, with OSM or MapMaker, you usually need to keep notes on mistakes you see in your business (I have several of these filled with corrections). MapZen allows this to happen right there in situ, as you see the errors on the street you can immediately correct them. Now I wouldn’t mind buying drinks for Google employees. Now, most of the folks hired by Google to fill in data on MapMaker aren’t working there any more, so they may appreciate the drink more than ever (just kidding guys!). Yes, I did say “hired by Google”. Though they claim to be working within a community, the overwhelming contributor is Google themselves. What percentage is internal or external to Google, I don’t know, because they don’t release the data to calculate those sort of stats. For OSM, we can plainly see which individual contributed how much, and produce all manner of stats. Though OSM has jsut a few folks producing the majority of data, that curve is flattening out rapidly. It’s great that Google is extending it’s services in Kenya and the developing world. Heck they even have a bus in India (we’re working a mapping matatu here ;). But the point is that with open source and open data, people everywhere don’t have to wait for Santa Google to gift them with new features .. all the tools are readily available for maps to leap frog in the developing world even more than the mobile phone. Author mikelPosted on September 29, 2008 September 29, 2008 Categories africa, openstreetmap3 Comments on Hout Bay OpenStreetMap Mapping Party!